Just Jessie B: Exciting Announcement! 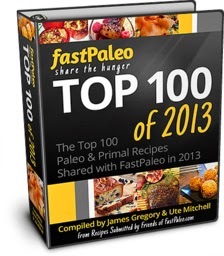 I was chosen by the super-sweet folks over at FastPaleo.com to be a part of their Top 100 eCookbook for 2013. That means that out of the thousands of recipes submitted on their website over the past year... they chose one of mine! So humbling, & SO exciting! They have put together a giant cookbook available for download on your computer. The package is $14.97, and gives you access to 1 main cookbook, plus 4 mini books (where you will find my Apple Cinnamon Muffins recipe). There are so many recipes out there on the internet... it can be overwhelming! FastPaleo really takes the guess-work out of things by giving you the top recipes all in one place, that have already been tried & tested. Thank you so much to FastPaleo for including me, and to all of my friends out there who have been supporting me on my blogging journey! I love you all! Yaay! Congrats on the selection.